Among the watch and jewellery brands at Baselworld, Luxari stands out with its home décor and art objects encrusted with thousands of Swarovski Elements. Baselworld, the world’s premiere jewellery and watch show, ends today. Among the exhibitors this year was Luxari, which creates neither jewellery nor watches. “While other objects in the show are wearable, our works are jewellery for the home,” stated Luxari’s Founder and Head Designer Daniel Jacob. The brand showcased 17 limited edition pieces from their home decor and art objects collection. 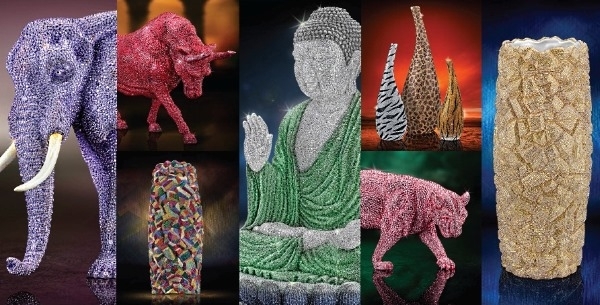 Each of their products is handcrafted and decked with Swarovski Elements. View the slideshow above for a sample of their work. Tagged Art, Decor, Interiors, Luxurious lifestyles, The Pad. Bookmark the permalink.